A wild chill warning will impact our location throughout the end of this week. Visitors recreating in the park should exercise caution against subzero temperatures and blowing snow. Hikers should use caution when transiting the trails. Trail snow depths range between 4-8 inches with a heavy layer of crust hidden under new snow make transit challenging. Some parts of the trails have ice hidden under layers of new snow making unexpected slips and falls possible It is recommended that hikers use cleats or snowshoes when traveling our trail system. 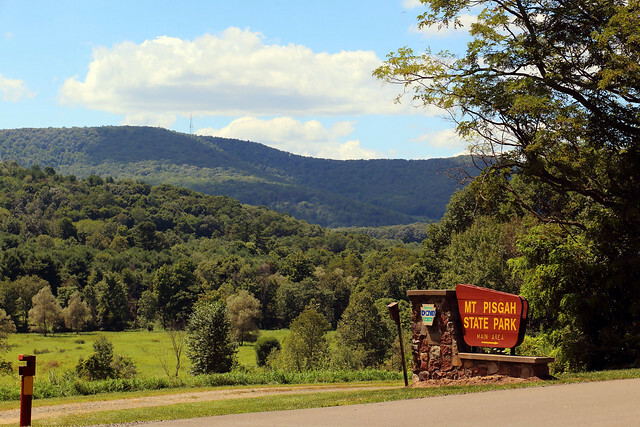 Mount Pisgah State Park is in the scenic Endless Mountains region of Pennsylvania’s Northern Tier. Midway between Troy and Towanda in Bradford County, the 1,302-acre park is along Mill Creek, at the base of Mt. Pisgah, elevation 2,260 feet. The park is only two miles north of US 6, the major route through the northern tier. Secondary roads passing through the villages of East Troy and West Burlington travel over rolling farmland to the park. A dam on Mill Creek forms Stephen Foster Lake, named after the famous composer and onetime local resident. The 75-acre lake provides fishing, boating, and skating. Adjacent to the park are Mt. Pisgah County Park and State Game Lands 289. The park office is open specific hours. The pool and other areas are open specific seasons and hours. Contact the park office for facility seasons and hours. Mount Pisgah is on Wallace Road (SR 3019), two miles north of US 6. During the spring and fall, programming shifts from interpretation for the general public to environmental education for school groups. The park serves as an outdoor classroom for area schools. Students participate in hands-on environmental education activities to further their awareness and understanding of the natural world. Reservations must be made in advance. For additional information about any programs provided by Mount Pisgah State Park, contact the park office. The park environmental interpretive center houses artifacts and displays linking us with our past. You can learn about early farm life and the wildlife around us.